I live in the center of a small urban city in Virginia. 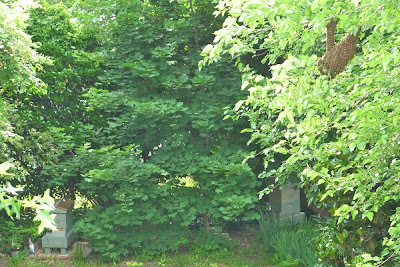 I began keeping bees in the Spring of 2009 on my property. Hive updates were posted to my Facebook account throughout that year. Through encouragement of those who commented on the pictures, I decided it was time for something more formal. In 2010 I added another hive to the yard, this is where this story begins. Animal Terrorist or Catastrophic Failure? 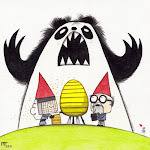 Early today my neighbor greeted me with the news that I had a swarm of bees in my tree that I had missed by an hour. I looked over at the tree where she told me they were and sure enough the tell tale signs of crumpled leaves coated with bits of wax. I pondered for a moment if they were mine since earlier this year I observed a feral colony in a hollow tree in another neighbor’s yard . I returned from running errands just after 5pm and was greeted by a mass of black airborne insects as I was pulling into my driveway. Wiki here has a picture of almost exactly what I saw. I knew they were mine this time. A little about swarms: Swarms happen when the hive feels as if they have no more room for growth. The lead up signs to the swarm include “swarm cells” which are peanut like cells hanging on the bottom of the frame. I did witness something that could have been interpreted as swarm cells in my last hive check, but I ignored them because they were in the top super and not in the lowest one like the textbook says they should be. Then again my saga since the last hive check is something else. Short story long, we were about to head out for the evening, a swarm project was not something I could get started with. By mid morning the next day I expected them to be gone. 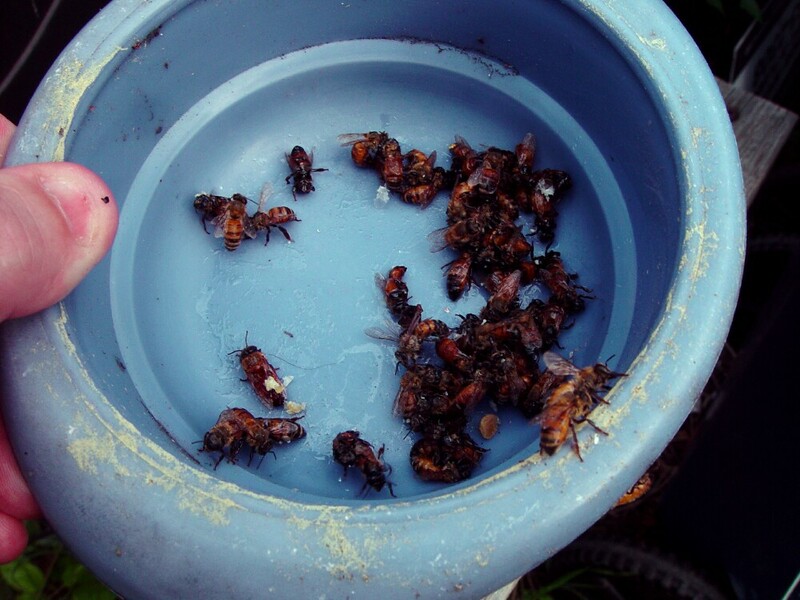 I had a moment where I felt sad they had swarmed and there was nothing I could do about it, but then I relized that I got into beekeeping not for the honey, but to help the bees and it brought me some solace knowing that my bees were helping to repopulate the local area. Today, I looked over and saw a light colored mass under the hive. I walked over thinking it was a plastic bag or something only to find out it was raw comb. Since we don't have any bears in the area... wait there was that one... seriously if it were a bear it would have knocked over the whole hive not just go for the low hanging fruit. Then again it could have just been the building of comb on the screen bottom board and one section got too heavy and pulled the others down with it. Most likely it was the work of a skunk who are naturally immune to bee stings. WAIT! Back up! 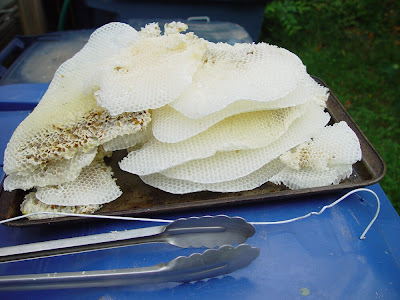 Why is there that much comb under the hive anyway? 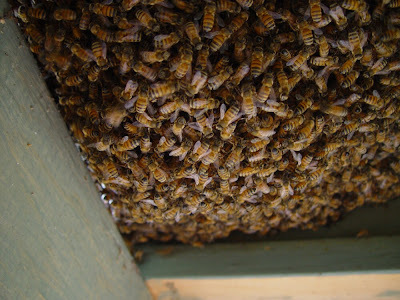 It had been 9 days and while the issues of the rear returning foragers hadn't stopped the only solution I could come up with was closing up the back of the hive. I however was afraid that this might encourage that space to be used as a super so I left it alone. Little did I know that is exactly what had been happening. In this picture you can see that they were actually raising brood in that comb. 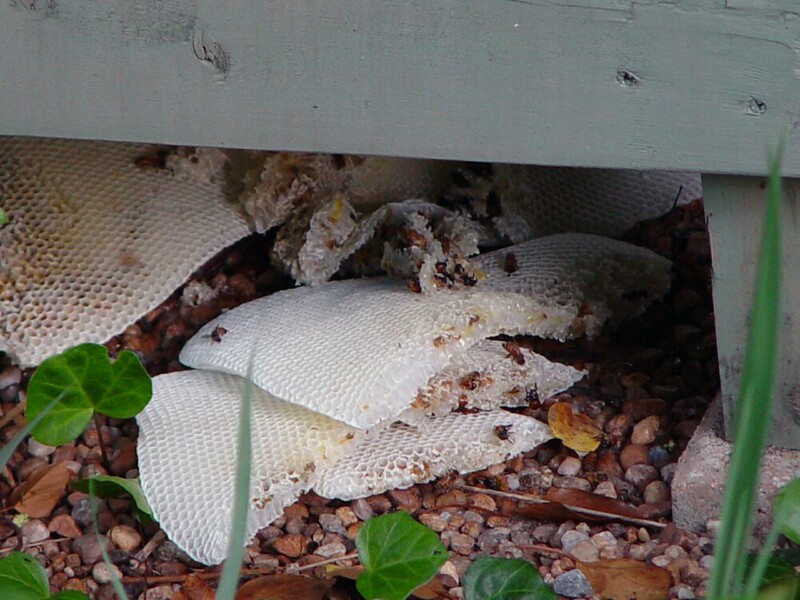 My only solution now is that the mass of bees under the hive was a swarm that didn't get too far. Knowing that if it wasn't an animal who caused this comb to fall, it was now just an open invitation of them sitting there. I set out retrieving the pieces using a coat hanger and the kitchen tongs. As you can see there was quite a haul for 9 days work. That is a 15" x 10" baking pan it is on. In the process of collecting the comb I freed a few bees that were trapped in the gooey wax/nectar and returned them to the area near the hive. I am hoping they will clean each other off and be able to fly again. In return one of the girls gave me the sting of my life as I inadvertently trapped her further between my finger and the comb. Yesterday we did a hive check on B2.1 and removed the Queen cage, I added my Ross Round Super to Club Fergie and pulled a frame of honey. Just a quick check and run. Noticed what appeared to be swarm cells on the bottom bar of a couple of frames in the top super. Could they be swarm cells? The cell placement on the frame is correct, but the location in the hive is incorrect being in the top super rather than near the entrance. One odd thing I noticed was that foragers were returning to the rear of the hive in the space for my screened bottom board. It was odd to see that but then I thought maybe the dance floor at the front was crowded so they had began using the screen under the hive to transfer nectar to the house bees. I changed the entrance space to a larger opening to give them more room to return hoping that would help with traffic. Today I looked in on them and there appears to be just as many foragers returning to the rear of the hive as to the front. 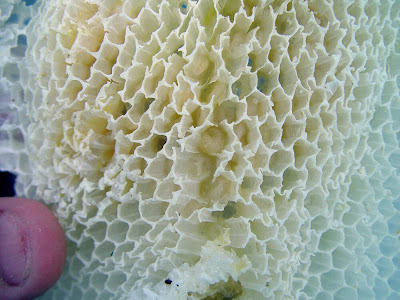 I wanted to know what it looked like under the hive so I took this picture. Not what I expected to see. I was expecting maybe a a few hundred bees but mostly the screen bottom. Instead my pictures revealed a large mass of bees that may be a swam that didn't get too far. If they are all foragers they will either return home or age will catch up to them.